Use your data to generate value. Reliafy is a free option to do your reliability analysis. Don't make your job harder than it already is. Use reliafy to simplify your reliability analyses. It has never been so easy for you to get the reliability characteristics of your assets. 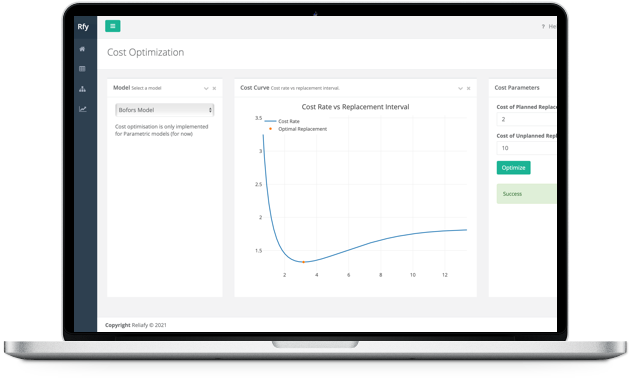 Model your failure data with the Weibull distribution and optimise your operations. Reliafy is a growing service. New features and capabilities are added regularly. Get in now to shape the future of reliafy. Reliafy was made to make reliability engineering simple. Your role as a reliability expert is difficult. Don't make it harder with complex and expensive tools, use reliafy. Reliafy is free to use and is getting beter every day. The reliafy team is dedicated to making your job easier and helping you deliver value to your organisation. Derryn is a reliability engineer with experience across many industries and a passion for improving maintenance with data. Does your product or equipment last forever? Need help in understanding if this product is for you? Contact us and a Reliability Engineer will get back to you with the assistance you need in understanding if Reliafy is the solution for you.